The Tereschenko diamond gets it's name from the one time owners of the diamond , the famous Tereschenko family of Russia, who were industrialists, entrepreneurs and philanthropists, in pre-communist Russia. The family owned several sugar factories around the country, and were also major land owners during this period. The diamond is a 42.92-carat,fancy blue, pear-shaped stone, and it is the second largest fancy blue diamond in the world, after the Hope diamond, which weighs 45.52 carats. The current estimated value of the stone is over $ 20 million. The country and mine of origin of the diamond , the year and date of origin, characteristics of the rough stone, including it's weight, the original owners of the diamond, the name of the cutters of the diamond, the place or country where the diamond was cut, etc are not known. But, it is on record that the diamond had been with the Tereschenko family at the beginning of the 20th century. Based on the information available, there are two mines in the world where this rare blue diamond could possibly have originated. They are the Kollur mines east of Golconda, and the Premier diamond mines in Transvaal, South Africa, two world renowned mines that were the source of exceptional quality rare blue diamonds over the years. The Premier diamond mine went into production in 1902, and there are no records of any rare blue diamond being produced in this mine in the early 20th century. Therefore the origin of the diamond was probably in the Kollur mines, near Golconda in Andhra Pradesh, Southern India. If one accepts Kollur as the possible source, the diamond might have originated any time after the mid 16th century, when the Kollur mines came into full production. In the mid 17th century when Tavernier visited Golconda, he observed that over 20 mines in Kollur were in active production, employing over 60,000 people. Assuming that the diamond originated in Kollur either in the 16th or 17th centuries, there are three possible routes the diamond could have taken in its journey to the west. The diamond could have been purchased at the source by a diamond dealer of western origin like Tavernier, and it is on record that there were many such enterprising European dealers who were combing the mines of the eastern Deccan plateau at that time. A second possibility was that the diamond was purchased by a Persian dealer operating from Golconda at that time. The Golconda kingdom of the Qutub Shahi dynasty (1518-1687), had close diplomatic, trade and religious ties with Persia (Iran). The Sultans of the kingdom were Shiite Muslims like the Iranians. A substantial quantity of gold and diamonds for which Golconda was famous eventually ended up in the treasury of the Persian Shahs. Even the Tereschenko might have first gone to Persia and from there found it's way to the west. A third possibility was that the diamond took the usual northwards route and ended up in the court of the Mughal Emperors from where it subsequently found it's way to the west like many other famous and historic diamonds. In any case details of names of any intermediate owners of the diamond before it came into the possession of the Tereschenko family are conspicuously lacking. Even the person from whom the Tereschenko family acquired the stone or when it was actually acquired are not known. The Tereschenkos were a very rich family in pre-communist Russia. They were landowners and industrialists. They owned several sugar factories in Russia. One of the members Mikhail Ivanovich Tereschenko, who was an industrialist as well as the owner of a publishing house in St. Petersburg, became a member of the Fourth State Duma, in the period before the revolution. Between 1915-1917, Mikhail Tereschenko was the chairman of the Military Industry Committee in the Kiev district and deputy chairman of the All-Russian Military Industry Committee. At the beginning of the revolution in February 1917, which overthrew the Monarchy, Tereschenko was appointed Minister of Finance of the Provisional Government. He was one of those actively involved in trying to bring the socialists into the government by forming an inter-party coalition. In May 1917, he was appointed Minister of Foreign Affairs, and was responsible for Russia continuing to play an active role in world war I, as a member of the allied forces ,which included France, Great Britain, Italy, Japan, and later the United States. However, after the October revolution in which the Bolshevik Party seized power, Tereschenko was arrested with all other ministers of the Provisional Government, and detained at the Peter and Paul Fortress. In the spring of 1918 he escaped from prison and fled to Norway and then France. Four years before the revolution of 1917, Mikhail Tereschenko, had deposited the diamond with Cartiers in Paris. In 1915 he instructed Cartiers to remount the gem as the centerpiece in a necklace, containing a variety of fancy colored diamonds. This necklace eventually became famous as one of the most unique and beautiful creations in fancy colored diamonds, for the 20th century. The necklace combined 46 diamonds of various shapes such as round, pear, marquise, and heart-shape, ranging in weight from 0.13 to 2.88 carats, and a variety of colors such as green, blue, lilac, rose, gold and yellow. Fortunately in 1916, on the eve of the Russian Revolution, the Tereschenko diamond was secretly taken out of Russia. Subsequently Mikhail Tereschenko sold the diamond to an anonymous buyer, when he was living in exile in Paris. After 1918, the Tereschenko diamond re-surfaced again only in 1984, when Christie's of Geneva announced the auction of the diamond. Before the auction at the request of several diamond dealers the diamond was sent to the G.I.A. laboratory in New York for grading and certification, and was later returned with the necessary documents. The auction was held on November 14th 1984, at the ballroom of the Hotel Richmond in Geneva. All the famous names in the industry were in attendance, and the bidding process started at 3 million Swiss francs. In less than a minute the bidding reached 6.5 million Swiss francs, far in excess of Christie's most optimistic estimate. Finally the auctioneer brought down the hammer in favor of a bidder from the back rows of the room, who shouted 10 million Swiss francs. this bidder was none other than the world renowned Lebanese diamond dealer Robert Mouawad, head of the international jewelry empire , Mouawad Jewelers, who had become a significant player at international diamond auctions. The Tereschenko was added to his magnificent collection of famous and historic diamonds. After the acquisition of the diamond by Robert Mouawad it appears that the name Tereschenko has now been changed to Mouawad Blue, as the name Tereschenko does not appear in the diamond Gallery of the Mouawad website. Instead the same 42.92 carat pear-shaped fancy blue diamond appears under the name Mouawad blue. The website gives the estimated value of the stone as $ 20 million. Nitrogen is a common impurity in the crystal structure of diamonds, and depending on the concentration of Nitrogen in the crystal structure, diamonds are divided into two main types. Type 1- contain detectable quantities of Nitrogen in the crystal structure, usually les than 0.1 %. Nitrogen usually imparts a yellow color to diamonds . Type 11-do not contain detectable quantities of Nitrogen, and the diamonds are usually colorless. Type 11 diamonds are further sub-divided into two. Type 11a-do not contain detectable amounts of Nitrogen. Being pure the diamonds are absolutely colorless. 1-2 % of all natural diamonds are Type 11a. Sometimes Type 11a diamonds can have structural anomalies due to plastic deformation, caused at the time of formation in the earth's mantle, or as the diamonds rose up to the earth's surface. Such deformations give rise to colors such as pink, red, purple, and brown. Type 11b- do not contain detectable amounts of Nitrogen, but contain trace amounts of another impurity Boron, which imparts a blue color to the diamonds. The diamonds also becomes electrically conducting. Such diamonds are less than 0.1 % of all naturally occurring diamonds. Thus the Tereschenko is a Type 11 b diamond ;so are the other diamonds in the above list. Blue diamonds are extremely rare because only 0.1 % of all naturally occurring diamonds have this color. Some colorless diamonds show a light bluish tint. This effect is caused by fluorescence. Eg:- Regent diamond, Queen of Holland diamond. Colorless diamonds that fluoresce intense blue under UV light, may show a bluish tint even in normal bright daylight that is rich in UV wave lengths. 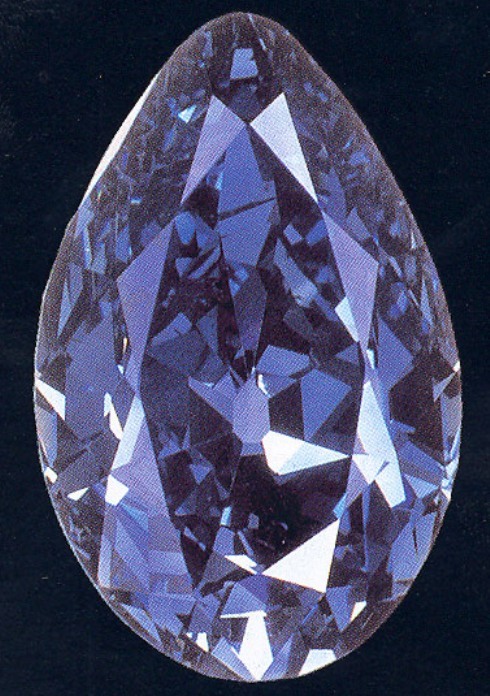 A good example of such a stone is the Portuguese diamond. It is for this reason that the Regent diamond, the Queen of Holland and the Portuguese diamond are not included in the above list. These are actually D-color diamonds that show a bluish tint due to fluorescence. The true blue diamonds are all type 11b diamonds.